In our Preschool programs, we offer your child the opportunity to do what interests them the most – to interact with children their own age and make new friends! 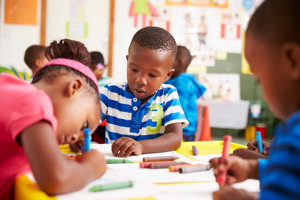 Our program gives the most active preschool child experience in cooperation with others in a group setting while learning organizational skills as they adapt to a classroom routine. Social interaction – Your child will learn how to share, take turns, and talk through conflicts when they arise. Physical Development – Your child will engage in physical activities such as skipping, jumping rope, dribbling a ball, walking backwards and balance. Cognitive Skills – The Preschool curriculum also includes science activities, math and language skills. These are taught with the use of various themes throughout the year. We help the children learn Christian characteristics and values such as kindness, love, forgiveness, and honesty. These characteristics are taught with the use of Bible stories and crafts. Children will gain an understanding of these Christian values and the importance of them in all their relationships.